This recipe caused me quite a bit of internal dilemma. I didn`t know whether to post it ASAP or save it for Fall. There are Girl Scout cookies in them, so I wanted to post them as soon as possible. Yet, the main ingredient is apple and apples aren`t really in season until Fall!! I might be exaggerating my dilemma, but you get my drift! 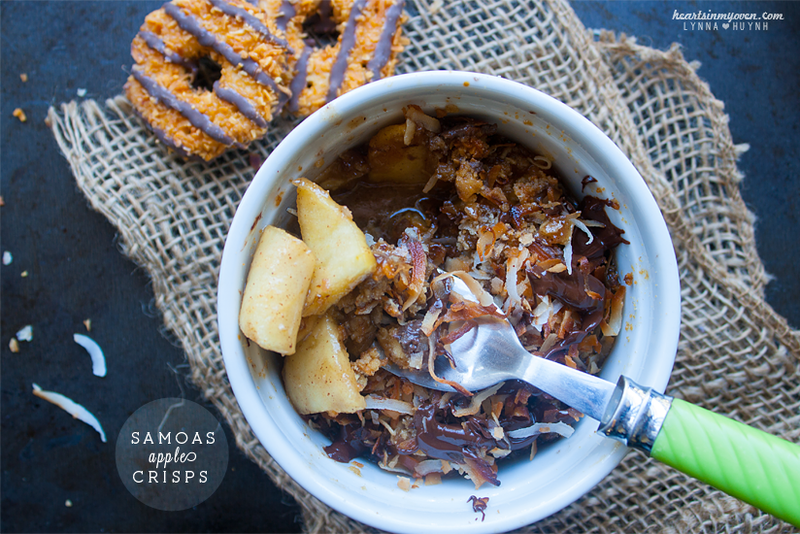 After saving this recipe for over a month, I realized the star of the show is the Samoas concept! I don`t know what your Girl Scout cookies buying habits are...however, if you`re anything like me, you still have a few boxes stashed in your freezer. Hah! Apple crisps can be one of the most simplest and satisfying desserts you can make. It`s uncomplicated and taste amazing. Although, this recipe requires only a slight more work compared to a microwavable apple crisp, it`s totally amazing! The only reason it involves more work is because you have to toast shredded coconut, which is easy, so no worries! :) The apple slices are coated in caramely goodness. Then, you have that wonderful crumb topping crisps are famous for. Finally, you get some crushed Samoas, coconut crunch and melted chocolate to top it all off. Are you drooling, yet? I would also like to add how freakin magnificent these smell. You have the apples, the coconut, the chocolate...ugh. SO GOOD. I ate a serving of this for breakfast for four straight days. I can eat this sweet treat anytime in the day! If you love those classic Girl Scout cookies or you`re a huge coconut fan, you`ll love these, without a doubt! And, if you wanna add a scoop, or three, of ice cream, I wouldn`t blame you! If you don`t have any Samoas cookies left, you can definitely omit them. You still get the theme with the caramel, coconut, and chocolate! 1. Preheat oven to 375°F. Grease 4 ramekins (about 1 cup capacity) well, or line/grease an 8x8 inch square baking pan. 2. 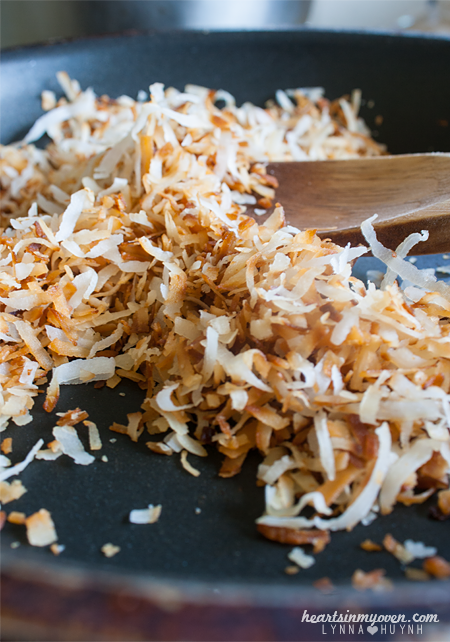 In a skillet, over medium-low heat, toast shredded coconut over stovetop. Occasionally toss the coconut around with a spatula until they are golden brown and crisp (about 5-8 minutes). Remove from heat and set aside. 3. In a small bowl, combine apple slices with caramel. Set aside. 4. In a medium bowl, combine brown sugar, cinnamon, flour, and oats. 5. Using a pastry cutter, or fork, cut in the butter until mixture resembles coarse crumbs. 6. Mix in one third of the toasted coconut. 7. Divide the apples slices at the bottom of each ramekins. 8. Divide and sprinkle crumb topping among each ramekin. 9. 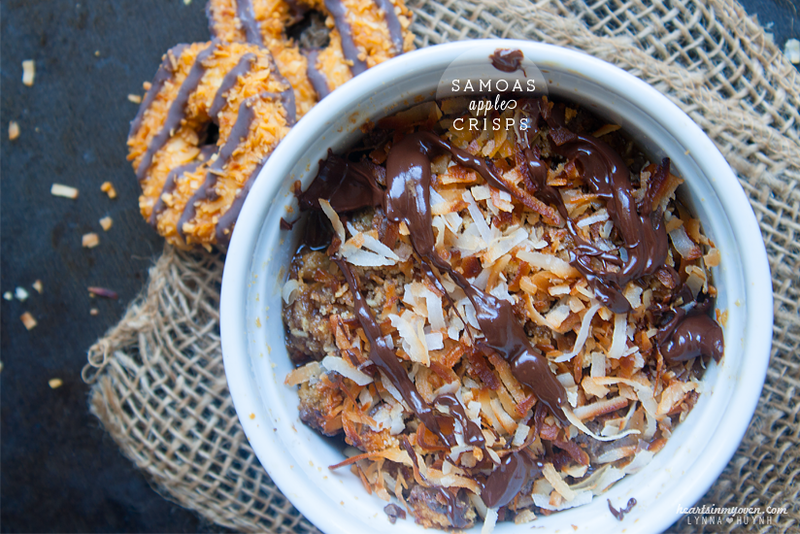 Add one third of the toasted coconut and crushed Samoa cookies on top of each ramekins. 10. Place ramekins on a baking sheet and bake for 15-20 minutes, until tops are golden and apples are tender. 11. 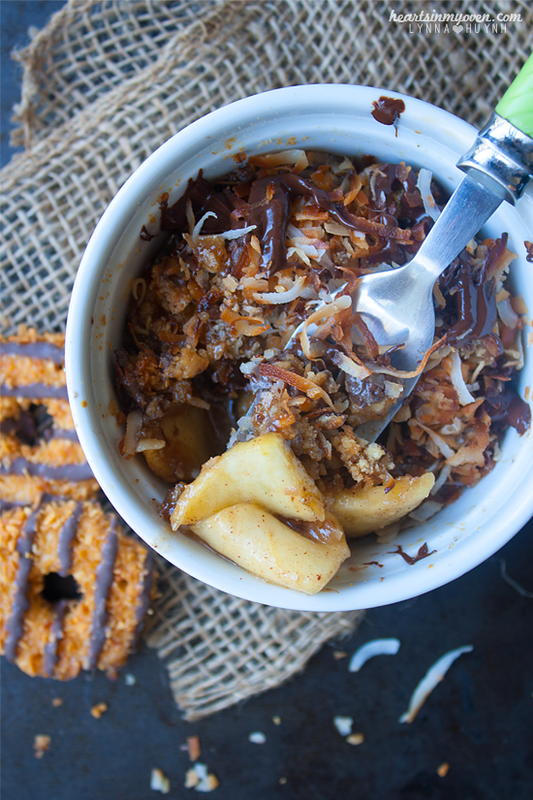 Top each apple crisp with the rest of the toasted coconut. 12. Melt chocolate in microwave, in increments of 30-15 seconds. Drizzle over the top in a stripe pattern. - I used 3 gala apples, but 4 would work if you`re baking in an 8x8 inch pan. - I baked these in 4 ramekins, so you might have to increase baking time if you bake in an 8x8 inch pan.